Tottenham forward Harry Kane could face Burnley at the weekend after returning from an ankle ligament injury sooner than expected. Harry Kane could be available for Tottenham's trip to Burnley on Saturday with the striker facing a late fitness test after he returned to training this week. Kane has been back in full training since Monday having missed their last seven games with an ankle ligament injury suffered against Manchester United in January. Kane was originally supposed to be out until March after sustaining the injury at Wembley but is back ahead of schedule in what is a crucial period for Spurs that includes games against Chelsea, Arsenal and Borussia Dortmund. Tottenham boss Mauricio Pochettino said: "He [Kane] is very good. I think we need to assess him in tomorrow's training session and then decide. "But I think he's doing well, I'm happy with him and maybe he's going to be available to be part of the squad for Saturday. "I don't think he's ahead of schedule but everyone knows Harry is an animal. "He wanted to be ready as soon as possible and he did everything to recover. "The injury he suffered is tough to recover from but we are so happy that in the last 10 days he was fantastic in training and can be available again - it will have a massive impact for everyone." 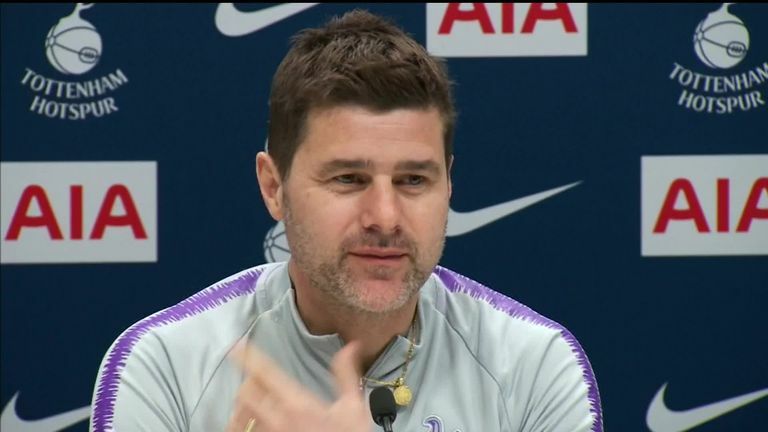 Asked whether the England captain feels he is ready to play at Turf Moor on Saturday, live on Sky Sports, Pochettino said: "I don't care if he feels he can play or not - who is going to decide in the end is myself with my coaching staff, the doctor, the medical staff and the sports science [staff]. "If you ask him 10 days ago he was ready to play but in the end the last word is always with me. "I'm the one who will take the risk, the decision and everything that is going on with the team." Midfielder Dele Alli remains unavailable with a hamstring injury he picked up against Fulham in January and Pochettino is unsure when the England international will return to first-team action. "His progression is good," the Argentine said. "We're happy. This muscle injury is different in how we assess it. "He's in the last part of his recovery and we'll see as soon as possible if he can be available to be involved with the team. "It's difficult to know [when he will return], maybe one week, maybe 10 days, maybe two weeks. "The last period is a key part of his recovery. We'll see because we're going to assess him day by day." Are Spurs learning to cope without Kane? Pochettino could have Ben Davies available for Burnley after the defender returned to training following a groin strain that has kept him out of the team for the last five matches. But fellow left-back Danny Rose is a doubt for the trip to Burnley with illness.